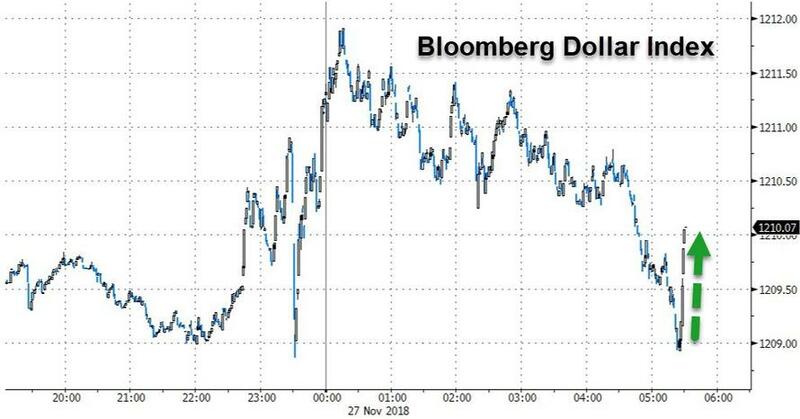 Dollar Jumps After Fed's Clarida Stays The Hawkish Course, Backs "Gradual Rate Hikes"
Moments ago, the text of Richard Clarida's speech "Data Dependence and U.S. Monetary Policy" was released and contrary to expectations for a dovish relent, the Fed Vice Chair backed "gradual rate hikes" even as the neutral rate remains uncertain. Predicting that the U.S. economic expansion will become the longest on record next year, Clarida said that "as the economy has moved to a neighborhood consistent with the Fed’s dual-mandate objectives, risks have become more symmetric and less skewed to the downside than when the current rate cycle began three years ago." He then cautioned, somewhat redundantly, that "raising rates too quickly could unnecessarily shorten the economic expansion, while moving too slowly could result in rising inflation and inflation expectations down the road that could be costly to reverse, as well as potentially pose financial stability risks." 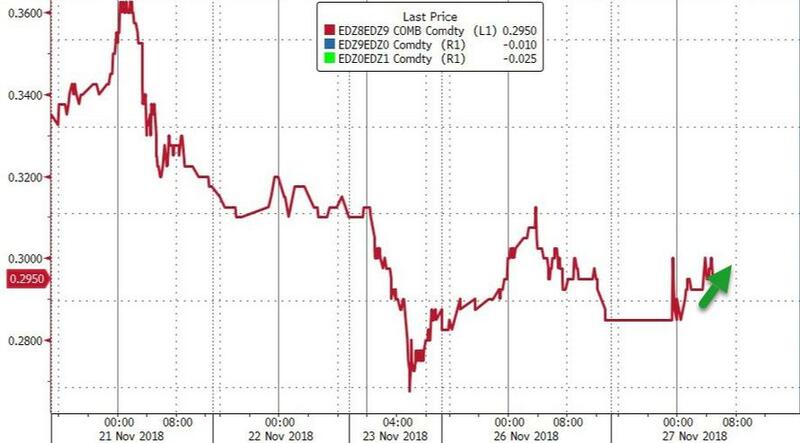 There was a tone of caution however, when Clarida referenced high frequency economic indicators, noting that Umich inflation expectations remain at the "lower end’" of range consistent with price stability, while TIPS show expected PCE inflation somewhat less than 2%. Clarida is cautiously focusing on inflation expectations, saying that "it is important to monitor measures of inflation expectations to confirm that households and businesses expect price stability to be maintained." He also said that "the central bank should find a way to communicate and explain how incoming data are or are not changing the expected path for the policy rate consistent with best meeting its objectives. Absent such communication, inefficient divergences between public expectations and central bank intentions for the policy rate path can emerge and persist in ways that are costly to the economy when reversed." Elsewhere, in what has been interpreted as a hawkish statement, Clarida referenced the key issue - where is the neutral rate, and will the Fed surpass it as Powell suggested two months ago - and said the process of learning about the neutral rate and optimal unemployment rate "supports the case for gradual policy normalization, as it will allow the Fed to accumulate more information from the data about the ultimate destination for the policy rate and the unemployment rate at a time when inflation is close to our 2 percent objective." But his most hawkish comment had to do with the size of the Fed's balance sheet, with Clarida saying he "wants to operate with the smallest balance sheet possible while still achieving objectives." The same goes for excess reserves: "Right now there are obviously abundant excess reserves,” and that influences short-run policy rates, and IOER is one that they use, he said during the Q&A portion. "We are discussing and thinking about the pros and cons of different approaches, and that’s a process that’s ongoing. Right now, the current system, I believe, serves us well." Offsetting this was somewhat dovish language regarding employment dynamics, observing the continued shortfalls in labor participation among prime age women & among 25-54 year old men particularly. On that front, Clarida said he sees room for prime-age labor participation to rise, and says productivity gains are both cyclical and structural. Looking at the economy, Clarida had one particular warning, noting that "an improvement in business investment will be important if the pickup in productivity growth that we have seen in recent quarters is to be sustained." "At this stage of the interest rate cycle, I believe it will be especially important to monitor a wide range of data as we continually assess and calibrate whether the path for the policy rate is consistent with meeting our dual-mandate objectives on a sustained basis." And then this from the Q&A: "As you move further away from zero, and as you move toward the range -- the vicinity -- of estimates of the ultimate destination, I just think it’s intuitive that you need to become more data-dependent” Clarida said about adjusting the Fed’s main policy tool, the target range for the federal funds rate. Finally, and least dovish of all, is the fact that Clarida did not mention the weak global economic environment at all, suggesting that - for now at least - the Fed is not concerned about the rising economic headwinds rocking Europe, China or other EMs. 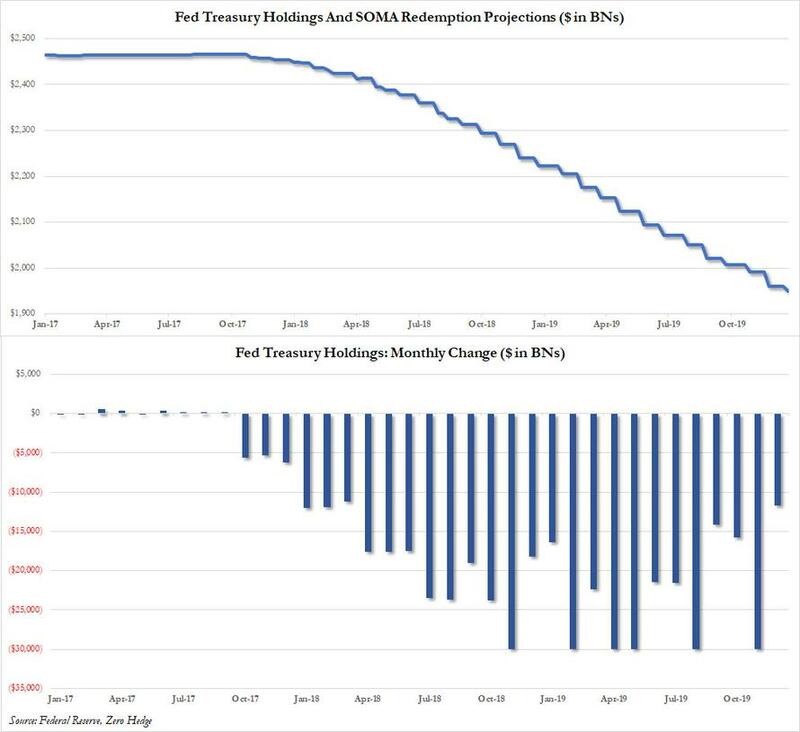 ... while 2019 Fed Funds saw a tiny uptick, from 28.5 to 29.5 bps.